Beautiful watch. This watch is stunning. The large face is exactly what I prefer. This watch can be dressy or casual. The weight of the watch is light and the clasp is very secure. It is easy to set the time and the band is exquisited. Was not sure what I was looking for in a watch but....I chose the right one for an excellent price. 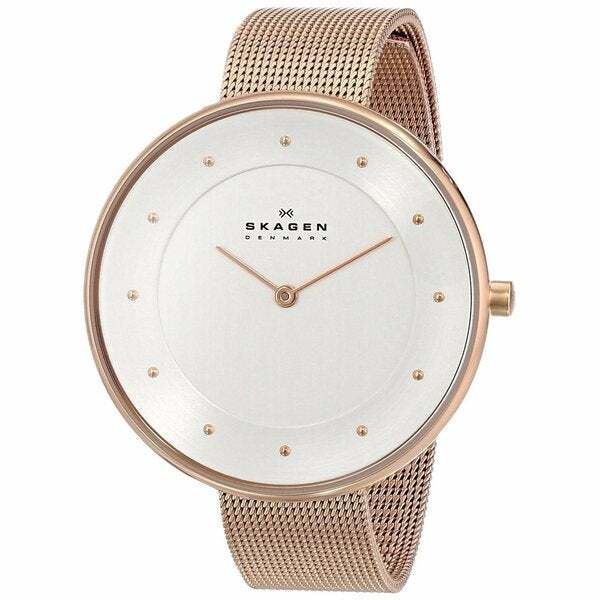 I am exceedingly happy and enjoy wearing the Skagen Women’s watch on a daily basis. Where I go I get compliments. You never can go wrong with this watch. "Capture the simple elegance of springtime renewal with this rosegold-tone accented watch. The Danish-inspired minimalist watch facepaired with a rose gold-tone woven steel band creates a sense ofeffortless elegance. Inspired by seaside village of Skagen, theoversized face features a nearly edgeless crystal that mimics thewide-open possibility of the ocean. this watch is elegant, perfect for wearing to work and at a casual environment. It was also easy to adjust the mesh band by watching a youtube tutorial. Also, the rose gold color is very beautiful, it is subtle and not shiny like most of the other watches. Very satisfied with this product, will definitely recommend it to any lady who is looking for a great watch. I had to watch videos to learn how to 1) fasten the clasp and 2) adjust the length, but this is very elegant. I decided to hop on the rose gold trend about 18 months after it started, but I'm happy with this purchase; it's part of several new rose gold ensembles. The watch face was bigger than I anticipated but I kept it because everyone loved it. There's no second hand, but it's very sturdy. I've worn it every single day since I received it in December. It's easy to adjust the strap size if you youtube a tutorial. (takes 10 seconds). I will probably buy this same watch for the rest of my life if it keeps being awesome. Needed a rose gold watch to add to my collection. This is a fantastic addition, I get compliments all the time. The price is also fantastic! THIS WATCH IS STUNNING. BOUGHT A SKAGEN AS A GIFT A FEW YEARS BACK AND HAVE ALWAYS WANTED ONE. Beautiful well made watch, but the clasp is a IQ test I fail most often. I am sure it makes it prettier or lay flatter...its just takes 2 people.to get the clasp on. Stylish and easy to read without my glasses. I have had many compliments. "What is the size of this watches face in inches. 22 mm seems very small & I want a man's size face. Thankyou."